The bowed psaltery is a type of psaltery - a harp alike medieval instrument - which is played with a bow. In contrast with the centuries-old plucked psaltery, the bowed psaltery appears to be a 20th-century invention. We recorded every second (=flat) string of the Bowed Psaltery in different modes: Sustain/ legato notes as seperate upbow and downbow stroke variations with additional release notes, short (app. 3sek.) as well as staccato bowed notes in 4 times Round Robin and tremolo notes. We expanded the original key range (C1-F3) to F0-C4. Beyond that we recorded "slow - tremolo" loops in a range of two octaves. 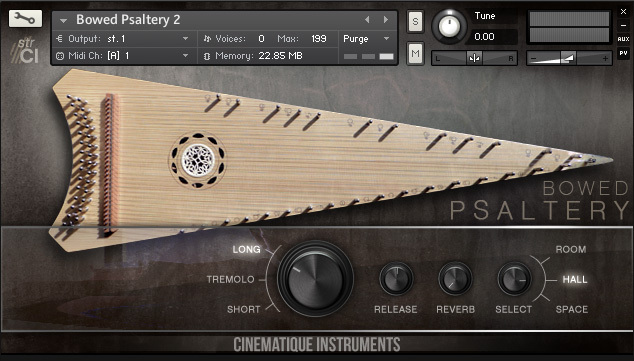 Update: In 2015 we updated the Bowed Psaltery and put together all separate patches into one complex patch covered by a brand new GUI. It is now possible to play all different articulations in one patch.